Families riding bikes, children on roller skates and barely a car in sight; it's hard to believe this is usually one of the busiest roads in Mexico City. It's an eerily calm Sunday morning on the city's Avenida Reforma, an avenue which is grid-locked on weekdays by tens of thousands of cars sitting bumper-to-bumper. 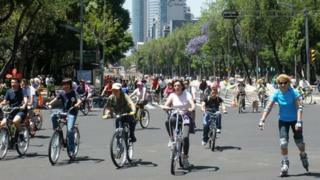 The Reforma's closure to car traffic on Sundays in 2007 kickstarted the capital's attempts to make life easier for cyclists. In 2010 a 17km-long bike lane through the city opened - and more efforts to promote pedal power are being unveiled in the coming few months. The city council, along with cyclists' associations, has just released its Urban Cyclist Manual, a comprehensive guide for cyclists in the city, and the first of its kind in Latin America, authorities say. Vintage bike shops are springing up in trendy neighbourhoods across the city, and more and more people are choosing bikes to get around. Perhaps the biggest factor has been the launch of the so-called Ecobicis (Eco-bikes) in 2010. Following on from similar schemes operating in London, Paris and Barcelona, Mexico City launched a public bike rentals at 90 different sites. Since then, some 30,000 people have joined and there is a waiting list for new members. The Ecobici system is expected to expand to 75,000 users by the end of 2012, with 4,000 more bicycles made available at new sites. In 2007, Mexico City's local government launched a 15-year-long green plan to promote cycling, hoping that by the end of 2012 5% of trips made every day would be by bike. The government of the city's left-wing mayor Marcelo Ebrard has also unveiled a plan to install bicycle lanes along more busy roads in the city centre. Despite all of this, only 3% of journeys around Mexico City are on bicycles. There is much work still to do. Traffic in some areas is so slow (around 6km/h at rush hour) that the bicycle has become one of the fastest means of transportation, argues Martha Delgado, Mexico City's minister of environment. Despite the European-style initiatives, Ms Delgado denies the mayor is trying to create a Latin American version of Copenhagen, one of Europe's most bike-mad cities. Rather, she says, this is an experimental strategy for commuting in mega-cities. "This is a new model for one of the largest cities in the world. Here you cannot do the entire trip from home to work by bicycle, it's just not practical. Rather you might use the subway or bus and then take the bike for the last few miles," she tells the BBC. "There's something happening with bikes," says Andres Lajous, a keen biking activist. "I'm not sure we can call it a revolution yet, but groups of urban cyclists are beginning to organise themselves, without the need of the authorities, interacting via Twitter or through blogs." In October 2011, several pro-bicycle groups decided to paint their own bike lane at the gates of the Mexican Congress to demand more funds for bike infrastructure. The wiki-lane, as the initiative was called, aroused the sympathies of other cycling groups across Mexico. Among them were several cities with a reputation for violence, such as Saltillo, Tijuana and Chihuahua, where mass nighttime bike rides have already caught on. But empowering cyclists is not universally popular. Mexico City's drivers spend up to four hours a day on their journeys to work, with three separate rush-hours. Some say cyclists have only made matters worse. "It is too risky to have more cyclists, they don't care about the cars, have no respect for us and neither for the rules," says Eduardo, a pesero (minibus) driver. "They move around and dart between the vehicles too quickly. It used to be the cyclists who had to be careful in Mexico City, now it's us or even the pedestrians," he says. In August, local radio host Angel Verdugo angered bike users when he called on car drivers to run over the cyclists. He said championing the new breed of cyclists was a form of racism. "They want to be like Europeans," he says. "They believe they are living in Paris and riding along the Champs-Elysees." Mr Lajous knows it will take time for negative attitudes to change. "The increased visibility of cyclists has generated a reaction in part of the population who think cycling is for a few crazy posh people, and wonder why public money should be devoted to promoting it," he says. "They say we want to live in Amsterdam and that Mexico does not have that culture. But they seem to forget that the bicycle has been used in this city for decades." Alvaro Caso, a 53-year-old artisan who made his own bike, is an example of how attitudes are changing. "I use my bike when I don't feel like spending hours in a jam and use my car when I'm tired of pedalling," he says. "Many say I'm suicidal, but it's not as hard as it looks". But he thinks it will be some time before cyclists and drivers learn to share Mexico City's roads harmoniously.